SÃO PAULO, BRAZIL – Brazil’s Municipal Human Development Index (MHDI) rose nearly fifty percent in twenty years, the Brazil 2013 Human Development Atlas has shown. Using data from the 1991, 2000 and 2010 censuses, the study by the United Nations Development Programme (UNDP) showed that Brazil’s overall MHDI climbed from 0.493 (“very low”) in 1991 to 0.727 (“high”) in 2010. Human development indexes show increases, but still education remains a challenge, family in Forteleza, Ceara (taken in 2005), photo by Christian Garimberti/Flickr Creative Commons License. The 47.5 percent increase was mainly down to improvements to life expectancy, but poor education hampered greater success. In 2010 Brazil attained “very good” on longevity (0.816), “good” on income (0.739), but only “average” (0.637) on education. Data on 180 socioeconomic indicators is filtered into three marks: “longevity,” “education” and “income,” from which the overall score is calculated. Below 0.49 is “very low”, 0.50-0.59 – “low”, 0.60-0.69 – “average”, 0.70-0.79 – “high”, and 0.80+ is “very high”. The new Atlas showed 85 percent of municipalities left the “very low” human development bracket and 74 percent now place “average” or “high”. In 1991, no city scored “high” and only 0.8 percent were considered “average”. Dramatic improvements to longevity and income has driven up MHDI scores: average life expectancy grew 9.2 years to 73.9 years in 2010, with the increase being largely attributed to reduced child mortality rates. The longest life expectancy (78.6 years) was recorded in the southern state of Santa Catarina; the worst (65.3 years) was registered in the northeastern states of Paraíba and Alagoas. The average Brazilian saw their monthly income increase by R$346.31 (US$152), with the highest income (R$2,043) in São Caetano do Sul, São Paulo state (which also had Brazil’s highest overall MHDI at 0.863) and the lowest (just R$96.25) in Marajá do Sena, Maranhão state. 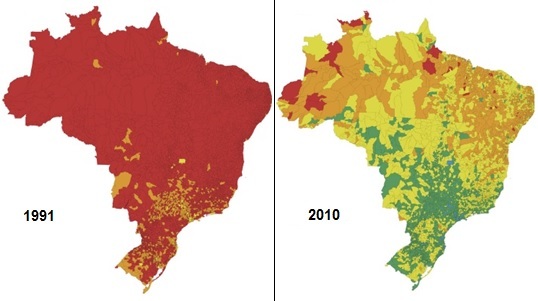 Brazil’s overall MHDI jumped from 0.493 in 1991 (“very low” – red) to 0.727 (“high” – green) in 2010, images by UNDP/Atlas Brazil 2013. The 13.3-year difference between top and bottom life expectancies and the staggering 2,000 percent variation in incomes have once again highlighted Brazil’s glaring north-south divide. However, despite massive improvements in education since 1991 – climbing from a paltry 0.278 to 0.637 by 2010 – it remains the biggest obstacle to greater development. Even in 2010, only just over half of over-eighteens had completed their nine years of basic schooling. Although the government’s key social program, the Bolsa Família, which gives families cash partly in exchange for children attending school, has been credited with improving attendance levels, the UNDP said it could at best be given “Oscar for best-supporting actor”. “The battle of getting children into schools has been won. Now the challenge is keeping children in school and completing school stages (ciclos) at the appropriate age,” said the UNDP’s Daniela Gomes Pinto. Of Brazil’s major cities, São Paulo (0.805) and Brasília (0.824) both scored “very high”, but Rio just missed out on the top bracket, scoring 0.799 with education again stymieing improvements. Previously ninth best MDHI in Brazil, Rio fell to 61st place in 2000 but rose to 45th in 2010, a position that Rio State Governor Sérgio Cabral attributed to “decades of absent investment in education, health, infrastructure,” promising Rio would be “in a better position” in future. Economists also point to Rio’s highly disparate population, of which 22 percent inhabit favelas, for the poor MHDI score. I’ve read the results of this study on several sites including the original source site. It’s great news that Brazil has made significant improvements. Yet, oddly, while we enjoy the highest taxes and most bloated government in the region, Brazil still could not manage to beat the average of all Latin American countries. With the end of the commodity boom and the resulting 1-2″ GDP growth, where will the money come from to improve education? And while school attendance has improved, the average Brazilian student is in school half as many hours annually as his Japanese counterpart. Not surprising how low Brazil scores in education.